The team prepares to work on the windshield and the back glass. In order to begin, they need to apply butyl tape to surround the area, along with pinch weld primer, which will enable the tape to stick. After the pinch weld sets in, the tape will be applied, and then the windshield and back glass will be re-installed into the 1965 Chevy Malibu SS restomod. 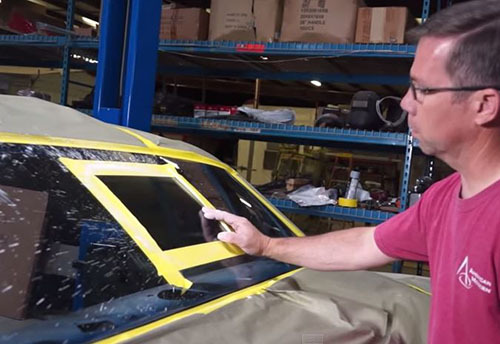 After installing the windshield, the trim can be re-installed as well, but not until after the car has been repainted. The back glass was also re-installed, and in the process, the team discovered some unwanted scratches. They will now attempt to buff out any of the scratches so that the glass is clean and easy to see out of. The Chevy Malibu’s back glass will be taped and masked off before buffing to make sure they concentrate the area where they found the scratches. The attempt to buff out all of the scratches was a failure, so the team will now need to completely replace the window. Now that the windshield and back glass has been put back onto the classic car, watch as The Build team continues to put back together the 1965 Chevy Malibu. Make it your top priority to watch the other episodes on our YouTube channel, and follow the progress of our collector vehicle on our Facebook page too!